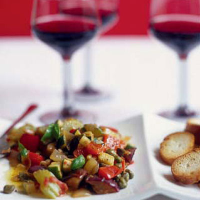 Tomatoey caponata is the Italian answer to French ratatouille. As well as being a great topping for crostini, it can also be made as a side dish and would go well with turkey or a roasted fish. It can be served warm or cold, and keeps well in the fridge for up to 2 days. Preheat the oven to 170°C/gas 3. For the crostini, arrange the bread on a baking sheet, drizzle with the olive oil and season. Bake in the oven for 5 minutes, or until the slices are golden brown. Remove and cool on a wire rack. Transfer the cooked pieces to a colander so that any excess oil drips out. Wipe the pan and heat the remaining 2 tbsp olive oil in it over a medium heat. Add the onion and celery and sauté for 4–6 minutes, or until golden brown. Add the red pepper and cook for 3 minutes, followed by the courgettes for a further 2–3 minutes. Now add the aubergine and tomato and cook for another 2–3 minutes, still stirring. All the vegetables should be tender and heated through, but not sludgy and soft. Finally, stir in the pine nuts, capers and olives, season well and add the basil. Spoon the mixture on to the crostini and serve. The Corker recommends: a generous and rich shiraz from Sicily has the same kind of lazy relaxed appeal as the caponata itself.